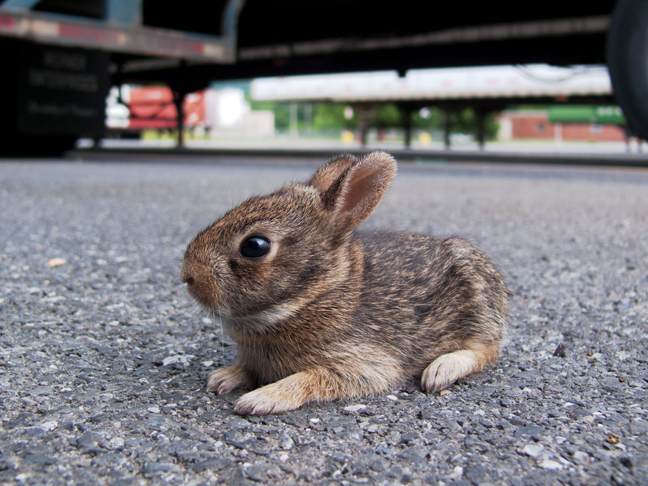 Not quite bunny season yet, but an article posted yesterday by the Associated Press brought this image to mind. My thought? The vulnerability of animals. Aside from bacteria, viruses, and plants, we are the dominant species on the planet. What we do has consequences for nearly every other species. We determine whether they live or die. And if we allow them life, we determine the quality of life they will live. Most everything we do affects butterflies, birds, reptiles, amphibians, fish, small and large mammals both wild and domesticated, and even plants. We exercise such immense power largely by virtue of our increasing numbers and our unthinking innate desire to exploit for our own benefit. We want what we want when we want it and, unless prompted otherwise, we don't care what the consequences are. Case in point is that article I read yesterday. The AP reported that legislators representing certain portions of agribusiness are in the process of bringing forth legislation in state, local, and national forums that seeks to limit the ability of ordinary citizens, organized and not, to monitor and curtail the inhumane and socially irresponsible abuse and exploitation of animals for profit. The main justification and argument for such legislation is that what happens on private property should be private and not subject to scrutiny by disruptive activists citizenry. Proposed legislation seeks to ban cell phones and cameras from work places and make it a crime to surreptitiously enter such premises to record inhumane animal treatment. And, if done anyway, seeks to confiscate under penalty of law such recordings and images within 24 or 48 hours by officials of government, who may in fact be politically funded agents of suspect industries willing to suppress or ignore said evidence of animal cruelty. In other words, instead of democratic checks and balances toward a more socially responsible society, we have the makings of institutionalized corruption toward maximizing the profits of a few at the expense of both democracy and every vulnerable species on the planet. What makes for such disturbing short-sighted selfishness is hard to imagine. A genetic drive toward dominance and mastery? But we have contemplative brains that allow for the modeling of consequences before we act. Social psychological factors like the herd instinct wherein we justify our own actions by the actions of others around us? Again, we have independent agency, privy to our own private thoughts wherein we can quell socially inspired fears and urges and decide to act individually in manners more responsible. Is it that our institutions are inadequate to the task of urging us toward more socially responsible behavior? Police, courts, and regulatory agencies are perhaps needed, but few of us want to fund them and many complain they represent Big Government invading our lives. Or, are the reasons cultural? Some citizens apparently do justify their antisocial and socially irresponsible values and behavior by pointing to religious texts claiming we humans are "the children of God", have dominion over all else, and can therefore do whatever we want with God's implied blessings. But other media, such as the one you are currently reading, present the message that the chain of unfortunate consequence is a much more compelling argument for acting responsibly. The crude adage "what goes around, comes around" seems apt, but it is incomplete. As individuals, we each have the power of gods in that whatever we do will have consequence. Fortunately, the blessings given us at birth include the nurturable ability to research, model, and choose consequences healthful and sustainable, not just for ourselves, but for all of us, including the most vulnerable and exploitable creatures on our planet. Fail to develop and maintain a society that encourages responsible individual agency and it won't be just abused livestock, endangered species, and wayward bunnies suffering the consequences. We all will.